My bicycle pal Kevin Cannon missed the early 6 a.m. road ride in Red Rock Canyon and the scenic drive. I had a lovely road ride with my roadie friend Scott. We pedaled the Red Rock loop and chatted ourselves up the hill to 4,771 feet -- the high point along the Red Rock scenic drive. Kevin didn't get up in time, though he did do some road cycling later in the morning. But Kevin did come on strong for a mountain bike ride on the Bristlecone Trail on Mt Charleston at 4:30 p.m. and then an urban ride through the urban freak show of downtown Las Vegas. There's Kevin with my fattie, a Surley Pugsley single-speed, steel-framed, shock-less beast that I muscled up several hundred feet on the Bristlecone, I'm guessing that we were biking around 8,300 feet -- not too shabby when you consider the Las Vegas valley is around 2,100 feet or so. The Bristlecone Trail loop is about 6.5 miles, with the first 3.5 miles all uphill from the lower Bristlecone parking lot. Above, Kevin is cycling up the wide fire road, while Kevin is descending on a single track in the photo below. When it's 110 in the valley, it's a pleasant 80 at 8,500 feet on Mount Chraleston. The Pugsley, then, was off for an urban trek. I met Kevin at 8:10 p.m. at the Review-Journal parking lot and little did we know what awaited -- a homeless guy with a Winnebago on his bicycle, a stop at a quasi-art fundraiser outside with five other people and a bunch of blinking bicyclists in downtown. An arts woman wanted us to pay $15 each for a "cover" charge to watch a guy sing "Over The Rainbow." We passed, and pedaled off to Hop Nuts for a beer. I parked the Pugsley inside. An RJ reporter, Ricky, came over on his bicycle to Hop Nuts and we headed over to the boys at Banger Brewing on the Fremont Street Experience. Roger was recently struck by a car at a Sahara Avenue intersection in Las Vegas and was hospitalized. Here's a TV news story on Roger's incident. Few places play bigger than the hype. One of those is the Grand Canyon. I know some people get bored by the big hole in the earth. One of my favorite things about today was watching people come off the tour buses and see the looks on their faces when they see the canyon for the first time. They look like kids seeing and tasting candy for the first time. "Wow" was their most popular word. I strolled along the famed Bright Angel Trail for a bit, chatting with a park ranger who said there are 10 -- 30 calls for help a year from May to August, ranging from issues such as dizziness and heat stroke to twisted ankles and dehydration. The condors are also back. The ranger said there about 300 of the giant birds soaring around Grand Canyon. The rim trail is a great way to get to know the place. It's paved, with some easy access to the edge of the canyon. Getting doored is unpleasant when riding a bicycle. You're just happily pedaling away and whap! A metal car door opens and strikes you and your bicycle and next thing you're on pavement, assessing whether you have a broken collarbone or wrist. The threat is made worse by well-intentioned road designer who plan bike lanes adjacent to parking spaces. Like this in Las Vegas. Take the traffic lane and give yourself room outside the dreaded "door zone." Also, in Nevada motorists are required under law to move over one traffic lane if there's an extra passing lane when passing a bicyclist. This can be a problem when you're a bicyclist in a narrow bike lane and cars are passing you in their narrow lanes and buzzing you. 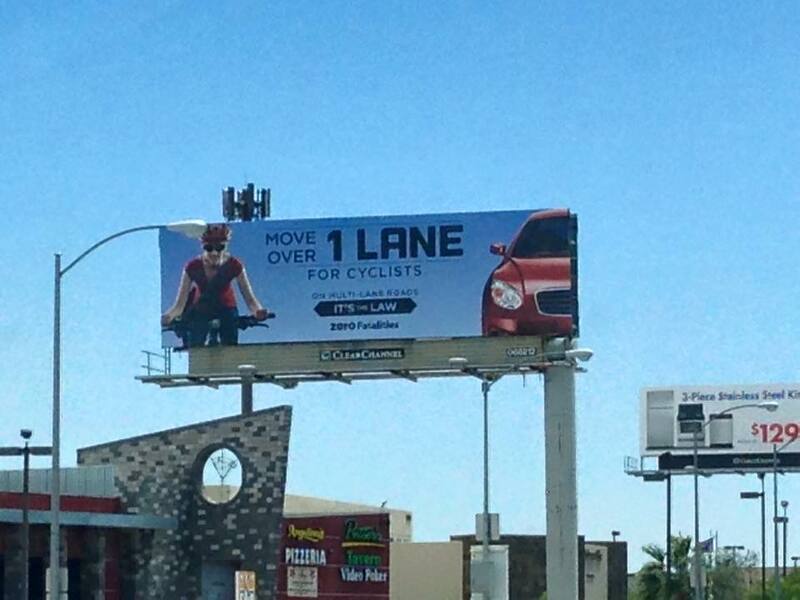 So move over and avoid hitting a bicyclist. Its's a gift to live so close to Red Rock Canyon and the 13-mile scenic loop, which meanders its way into the foothills of the Spring Mountains. Lots of roadies follow the hilly scenic drive. But there aren't too many mountain bike, off-road opportunities for two-wheelers. But there is Rocky Gap Road, an aptly-named bone-shaking rattler of a dirt and rock road that is a turn off the main loop and heads toward SR 160 toward Pahrump on the other side of the mountain. I took my SINGLE-speed Pugsley fattie to check out Rocky Gap late this afternoon. At the start of Rocky Gap is a fork in the path to take this trail. Bicyclists aren't allowed. I loved Rocky Gap because it doesn't feel like you're the desert back in this notch of a shake, rattle and roll road. The single speed can handle paved uphills. But the steepness was challenging. This doesn't seem like Las Vegas, does it? All types of human-powered machines out there. Here's an arm-propelled machine on SR 159 in Red Rock Canyon. How about unicycling up the Bristlecone Trail on Mount Charleston. It was throwback bicycles at a Henderson ciclovia event this past year. There's John, an 80-year-old who bikes up SR 159 into Red Rock Canyon every day. Don't forget to make the trip to the North Rim of the Grand Canyon Saturday for the Fat Tire Festival put on by Escape Adventures and Las Vegas Cyclery. Talk about your soaring temperatures. I was bicycling around 5:55 am today on SR 159 as I headed out to the Red Rock Scenic Loop. It was a quite-pleasant 69 degrees. About 20 minutes later as I started up the big hill on the loop, the temp was up to a pleasant 77 degrees. Another few miles up the road and about 15 minutes later, it was up to a doable 83 degrees. As it continued to warm up as I pedaled to the scenic overlook, about five miles into the loop, I did admire the gorgeous flowers at this early time of the day. And about an hour and a half into the ride around 7:30am, the mercury hit 90, up from the 69 degrees when I started the ride. It's triple digit temps for the next three months. So, it's road cycling at 6:30 a.m. at the Red Rock loop Sunday morning. And then if you want to bike in the afternoon, it's off to the Bristlecone Trail on Mount Charleston. You will never reach for your phone when driving ever again when you watch this video. What a police press release looks like when a motorist kills a bicyclist. Police call it a "collision." "On June 4, 2015, at approximately 11:38 PM, a fatal injury Hit and Run traffic collision occurred on E. Charleston Boulevard west of the intersection with S. Mojave Road. Evidence at the scene and a witness statement indicated a 67 ­year ­old male was riding a Specialized Mountain Bike, eastbound, in the right eastbound travel lane on E. Charleston Boulevard. The cyclist was struck from behind by an eastbound vehicle. "The impact forced the bicycle and rider to the ground. The 67 ­year­ old male was pronounced dead at the scene by responding rescue personnel. The vehicle failed to stop and remain at the scene. Parts of the vehicle remained at the scene from collision damage and were identifiable. The vehicle involved in the collision was a dark green 1999 Honda Civic DX 4­Door. "This was the 47th traffic related fatality in the Las Vegas Metropolitan Police Department jurisdiction for the year 2015. The collision remains under investigation by the Las Vegas Metropolitan Police Department Accident Investigation Section. Anyone with information is urged to call the Las Vegas Metropolitan Police Department Accident Investigation Section @ (702) 828 ­3595." 1. Bolts, Nails and Screws: It's an Ace hardware store out there. Back in Tampa, I collected so much metal hardware at intersections that I would collect the bolts. nuts and other items and store them in big jars. One day I sold a jar for $5 on Craig's List. No joke. 2. Gloves. They run the gamut from winter gloves to long-fingered mountain bike gloves to cut-off road cycling gloves. 3. Tools. I have a giant red tool box packed with the stuff I've found. Hammers, screwdrivers, wrenches, wire cutters. One day I actually found two hammers in Tampa. 4. Wallets. I have found three through the years and I either try and contact the person or, if I can't find them, I mail them back to the address on the driver's license. 5. Loose Change. Mostly dimes now -- even more than pennies. 6. Baseball Caps. All teams, including several Florida Gator caps that I have given to Gator fans in Tampa. I even found a cap I HAD LOST! Yup, found an old Hudsonian.com cap a few blocks from my house in Tampa. Not the usual roadie bicycle, a different type of bike in front of the market in Blue Diamond this morning.